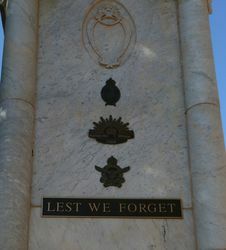 The War Memorial commemorates those who have served in the various conflicts in which Australia has been involved. It was initially erected by the residents of Charleville and district and the Charleville Sub Branch R.S.S.I.L.A in honour of those who served in World War One. All but the base of the Charleville war memorial is of Italian marble and was designed by George Gill who also designed the Esk war memorial. Corner plaques denoting all war zones were added in 1993 and four granite ‘digger’ statues, representing a Catafalque party, together with eight dividing granite bollards were added to the memorial for ANZAC Day, April 2010. The monument was unveiled by the Governor of Queensland, Sir Matthew Nathan on the 9th October 1924 during a Vice-Regal visit to the town. On Thursday in the presence of a large crowd of people, estimated at fully 3000, the Governor unveiled the memorial stone. It was very impressive. The Governor, in a feeling speech, referred to the sacrifice made by the people of the town and district, to the fact that in the whole of Australia conscription was not needed and by these brave men who cheerfully obeyed the call of the Empire, having in view, the safety and property of the country and their children. He briefly referred to the lesson of the great war and its costly but successful issue. He also mentioned the great part taken by New Zealand troops. The town band played several appropriate tunes. The Chairman of the Memorial Committee, Mr. H .J. Carter, assisted the Governor to unveil the memorial stone which is a huge block of marble, suitably inscribed. Townsville Daily Bulletin (Qld), 11 October 1924. "For God, King and Country"